The characteristic tree of English and Northern European countryside and forest. Mature trees have thick trunks and wide spreading branches with fissured grey-brown bark. Short-stalked oblong deciduous leaves with rounded lobes. Very small male and female flowers are produced separately but on the same tree, in late spring or early summer. 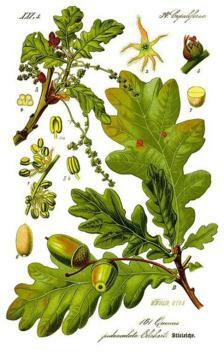 The nut-like acorns follow, green at first ripening to brown, held in stalked cups. Any well drained soil in full sun or part shade. 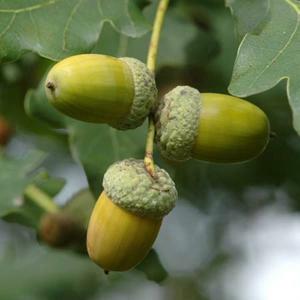 Easily grown from the large acorn seeds. Parklands, woodlands or field boundaries. Traditionally used for its high-quality, durable timber. The bark, taken from saplings or young branches, has been used medicinally for various purposes. 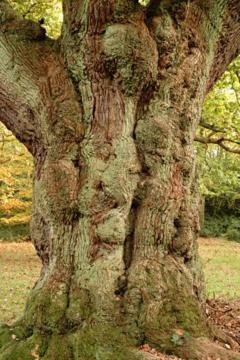 Very important native tree of Northern Europe, supporting a range of insects, birds and animals. British native. 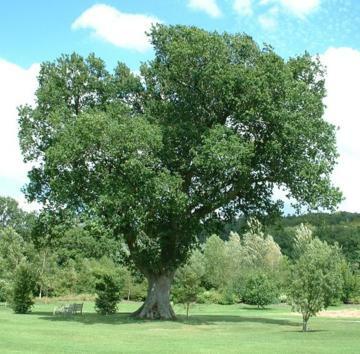 Chosen as the national tree, officially or unofficially, of many countries including England and Croatia. It is also a sacred tree in various cultures.